One of my favorite ways to share photos from Disney Parks and Resorts is by taking part in Instagram photo-a-day challenges. These challenges offer a prompt for each day of the month, and followers share pictures using the hashtag for the challenge. It's a great way to see all the fantastic photography out there, and a fun way to connect with others in the Disney fan community. Inspired by some of my favorite bloggers and Instagrammers (like @zannaland, @sparklynicole, and @mainstgazette), and with a big dose of encouragement and support from @thatsostelle from This Happy Place Blog, I decided to try my hand at doing my own challenge! In honor of my favorite park's birthday, we put together an Epcot-themed challenge for October. 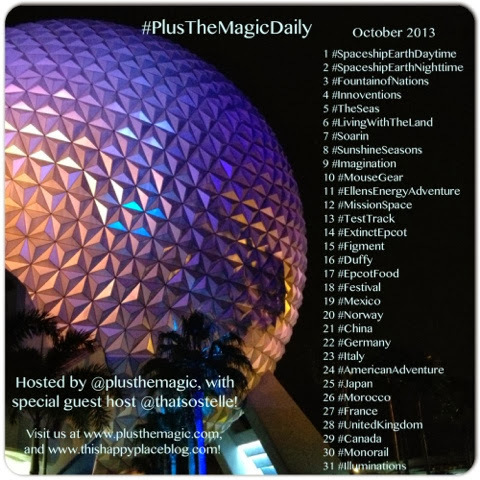 Join us on Instagram by posting your favorite photos each day, using the #PlusTheMagicDaily hashtag along with the hashtag for that day's prompt. I look forward to seeing all of your photos, and to following you on Instagram! Plus the Magic can be found on Instagram here.